Welcome! The next 200 Hour Teacher Training is held at Rooted in Wellness, Jacksonville, NC and begins in July 2019. Apply now! The Inspired Living Yoga Teacher Training is a course meant to encourage growth in body, mind and soul. 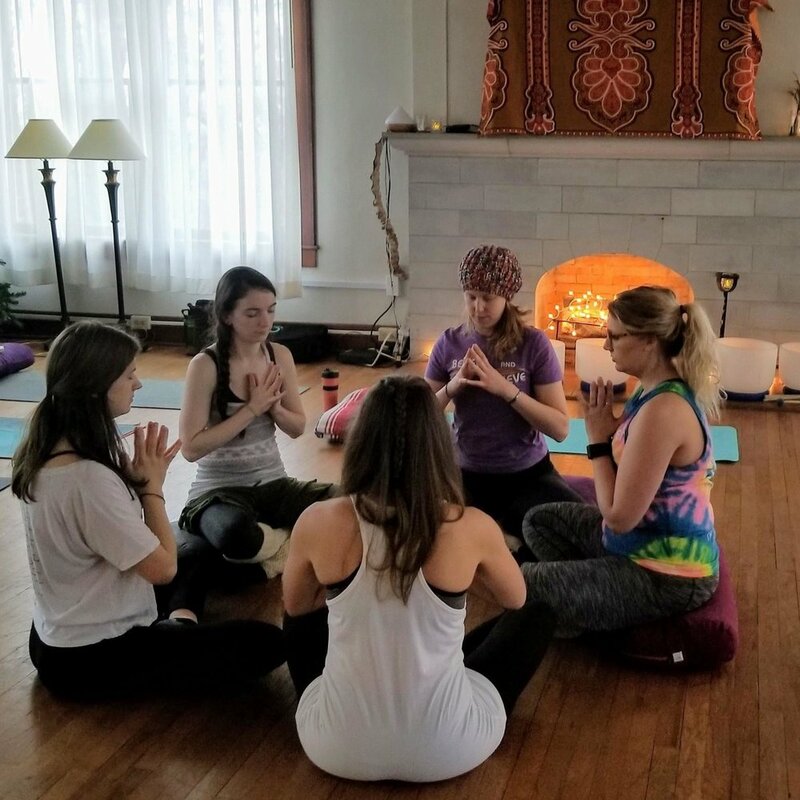 The 200 hour training program is broken down over 9 weekends designed to properly prepare the teacher to teach using the tools, principles and philosophy of Hatha Vinyasa yoga, anatomy and physiology, and the Yoga Sutras. In this training, you will learn the art of Vinyasa Krama sequencing (rather than a set series of postures) which enables you to teach any posture safely, effectively and cohesively. Expect to work hard, be challenged, and feel supported along the way! - Safe & updated alignment in poses, balanced & intelligent sequencing that reduces repetitive stress, and modifications to make yoga accessible to all. - Learn the functions of the muscular and skeletal structure. - Foundational history and philosophy of yoga - where the practice originated from, and why do we practice them? These deeper teachings can bring a higher purpose and meaning to your practice, your teaching, and your life. - Skillful, intelligent, and respectful hands-on assists and enhancements. You will learn how to create and maintain safe boundaries in the student-teacher relationship and how to empower your students to make the best decisions for their unique needs. - Trauma sensitive and informed therapeutic teaching techniques for special populations and students with PTS, PTSD, TBI, and other traumas. - Self-development: build confidence and learn how to deal with difficult situations. Uncover your own habitual patterns. A good yoga teacher training will give you the tools to grow as an individual and how to respond rather than react to stressful situations. The Inspired Yoga Teacher Training program goes beyond just the physical practice of yoga and learning how to teach. You will learn how to be better at being you and feel empowered to move forward with more ease and balance in your own life! There will be a mixture of lecture, home study, journal assignments, discussion, experimental discovery, active demonstration, projects, homework, and many physical practices. There is endless depth to the study and practice of yoga, and a 200 Hour training is truly the beginning of the journey! There are many topics to cover in a short period of time. However, the Inspired Living Yoga training program is designed to develop a strong, stable foundation of practical knowledge without bombarding the teacher with too much information. We will focus on the core fundamentals and principles of anatomy, physiology and sequencing as related to teaching yoga. You will learn about the 8 Limbs of Yoga as outlines in Patanjali's Yoga Sutras to inspire dedication, commitment and a lifestyle that is aligned and integrated with the yoga you will be teaching others. We will explore ancient texts such as the Upanishads and Bhagavad Gita. There are broadening assignments intended to give the space needed to explore other areas or styles of yoga that may be of interest to you (for example, Ayurveda, Bhakti, Kirya, Mantra, etc.). This program is a well-rounded training rooted in a strong lineage of teachers, dedicated personal work and study, anatomy, and philosophy. The invitation of the program is to first transform yourself and your practice before sharing the teachings with others. During the last module, there will be a written final exam, personal project presentation, completion of logged teaching hours and a 45 minute yoga class taught by each teacher. These standards are not meant to intimidate or frighten you - standards are necessary to help achieve goals and maintain integrity in the program. You will be given all of the tools, information and support you need along the way, and with dedication, you will be teaching from your heart and ready to share it with the world! A Yoga Teacher Training has the potential to open up your heart, mind and soul. - What are your motivations and intentions for attending a teacher training? - How does a yoga training support your goals, passions or your higher purpose? - What do you hope to "get out of" the training? - Where do you see yourself after the training is complete? What does your future, best life look like? You must complete all contact hours and attend all of the modules to complete the training. Anything worth doing is worth doing well and fully to the best of your abilities! If you are uncertain about a 100% commitment, that is okay! Take your time to contemplate where you truly want to dedicate your energy, time and money. Please reach out if you would like some guidance during your decision process! Training begins in July 2019. Different payment plans are available if you need assistance! Please reach out and we will work out a plan that makes the training accessible to you! We are a MyCAA approved program! 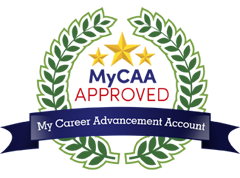 If you are a spouses of service members on active duty in pay grades E-1 to E-5, W-1 to W-2 and O-1 to O-2 , you may be eligible for a FULL scholarship to complete the 200 hour program! Find out if you are eligible. Rooted in Wellness is an oasis of healing - they offer therapeutic massage, Reiki, yoga, mental health care, skin care, spa treatments, and so much more! You can feel the warm, supportive environment the moment you walk in. It is truly the perfect environment to support the deep learning and self-discover of a yoga teacher training program. We are honored to collaborate and bring the Inspired Yoga Living teacher training to the Jacksonville, NC area! Learn more about Rooted in Wellness here. One of the beautiful practice spaces located at Rooted in Wellness for our 2019 program. We love the hardwood floors and natural lighting! There is also a meditation room and an outdoor courtyard we will utilize during the training program. What “style of yoga” is this training? You will learn how to teach Hatha-Vinyasa Alignment based yoga to students of all ages, abilities, and skill level. The methodology used in the Inspired Yoga Living Program transcends a specific style because you can teach any style you desire after the training! You will learn anatomy and physiology, understand how the body moves, and learn to teach direct action to your students. You will learn the principles of effective sequencing rather than be confined to a set sequence for every single class. The good news - you can still teach set sequences if you wish, and you will be provided with set sequences to get you started! However, you will also have the freedom to create your own sequences with a vast understanding of how to accommodate and modify for the students that show up to your class. You will be given a very clear, precise and intelligent road map to guide your teaching, and you will not be creatively restrained by a specific style. This gives you the flexibility to teach from your heart and share your unique interests and gifts in your own, personal teaching style. share your gifts and the teachings of yoga with the world! The training schedule depends upon location and may be updated to better serve the program. A yoga teacher training is a gift to yourself, your family and your community. You will learn self-soothing techniques for yourself and to share with others. You will understand how your own body works with deeper clarity and physiological knowledge. Tuition is dependent upon the location and program style (resident or non-resident). We have committed to maintaining a fair, ethical cost for our trainings so that all that every demographic and anyone that desires to share yoga will have access. Partial scholarships and trades are also negotiable. A specific reading list will be emailed after your application and deposit are received. The resources used in this training vary to tap into all learning styles. There will be documentaries, podcasts, readings, and lectures. Homework assignments will vary: reading, essays, journaling, videos, podcasts, etc. Whenever possible, the training will bring in specialists. The lead trainer for the training is currently Sarah Kadel, E-RYT 500. Learn more about Sarah here. After you apply, you will receive an email to schedule a phone consultation with Sarah so you can ask any additional questions. Then, you will receive a link to pay your deposit. Once your deposit is paid, you will receive a welcome packet PDF via email that includes the reading list and more information. Do you practice yoga at home? If so, do you use guided classes? And what is the practice space in your home like? What has been your favorite yoga class/experience? What made it so special? What has been your least favorite yoga class/experience? What did you not love about it? Do you have any experience, education, prior training, or studies in yoga, anatomy, physiology, massage therapy, exercise science, etc? Do you currently teach yoga, pilates, exercise, etc.? If so, where and for how long? Do you have any injuries or conditions that effect your physical yoga practice? Please describe. Do you need special assistance or considerations for any disabilties? (physical, learning, or any other disabilities) We want to be able to accommodate you in the best way possible! What qualities do you think "good yoga teachers" possess? Why do you want to learn more about yoga? Do you plan to teach yoga after completion of this program? Or do you plan to take it to deepen your personal practice and understanding of yoga? What do you hope to gain from this yoga teacher training? What are your expectations for any yoga teacher training program? Any training program requires dedication and commitment. Are you able to fully commit to the 9 weekend training schedule? Thank you for your application! You will hear back from Sarah shortly.